Votive and Tealight Candles, by The Weed Patch. Some of our standard stock is our very most popular votive candles, the Marmalade and the Birthday Cake by Allure (formerly Judy Havelka). Right up there is our own line of 100% soy candles in some pretty mouth-watering fragrances! We also have a seasonal/rotating supply of offerings by Time & Again (Ganz), Crossroads Originals, Tag, and more. Burnt Mustard / Cinnamon Jumbo Tealight Candle, by The Hearthside Collection. These primitive style candles are grubby, bumpy, spiced and distressed. 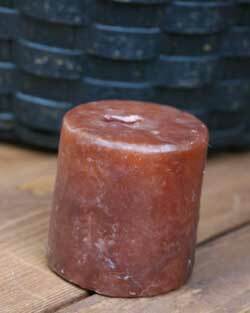 The Primitive Burgundy candles are a dark mottled maroon red color rolled in spices. Has a very light cinnamon fragrance. This is for a jumbo tealight sized candle, measuring approx 2 x 1 inches. Bigger than a standard tealight, more like a mini pillar. Other sizes and shapes also available! 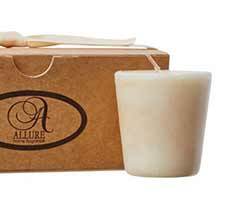 Highly fragranced, long burning votive candle by Allure (formerly Judy Havelka). Creme Brulee is a toasty cream color, and has a delicious, true-to-life sweet creamy creme brulee scent! This mini pillar candle is a bit larger than standard votive candles, measuring 2 inches in diameter at top, 1.5 inches at bottom, 2.25 inches tall. Burn time: approx 15hrs. Priced per candle. 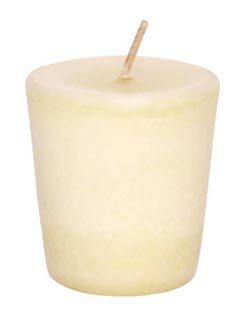 Highly fragranced, long burning votive candle by Allure (formerly Judy Havelka). Fresh Linen is a bright white color, and has the classic linen fragrance you associate with clean white sheets - one of the best "linen" fragrances we've sampled! This mini pillar candle is a bit larger than standard votive candles, measuring 2 inches in diameter at top, 1.5 inches at bottom, 2.25 inches tall. Burn time: approx 15hrs. Priced per candle. 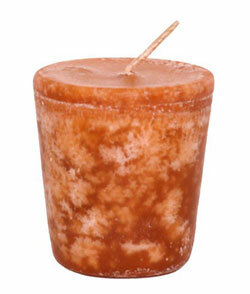 Mottled Orange Pillar Candle, by The Hearthside Collection. 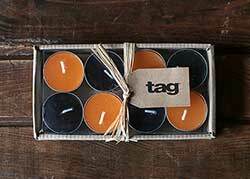 These primitive style candles are grubby, bumpy, spiced and distressed. The Mottled Orange candles are a dark pumpkin red/orange color. Has a light cinnamon fragrance. This is for a mini sized pillar candle, measuring approx 2.25 x 2.25 inches. Other sizes and shapes also available! Primitive Mustard Dripped Wax Pillar Candle, by The Hearthside Collection. These primitive style candles are grubby, bumpy, spiced and distressed. This style is a mottled mustard color, rolled in spices, with splatters and drips of dark colored wax. Has a very light cinnamon fragrance. This is for a mini sized pillar candle, measuring approx 2.25 x 2.25 inches. Other sizes and shapes also available! 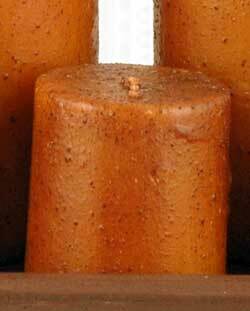 Mustard Primitive Pillar Candle, by The Hearthside Collection. 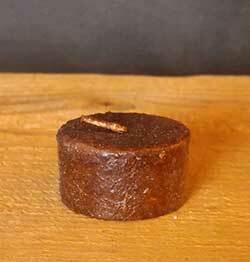 This primitive, grungy pillar candle is a mottled burnt mustard color, and has been rolled in cinnamon. Has a light cinnamon fragrance. Measures 2.25 inches wide by 2.25 inches tall. 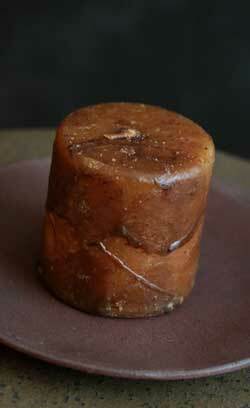 Primitive Mustard Pillar Candle, by The Hearthside Collection. 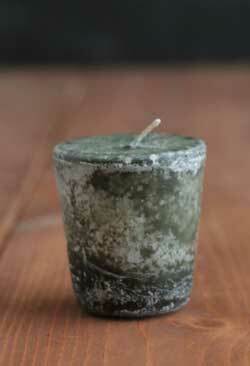 These primitive style candles are grubby, bumpy, spiced and distressed. 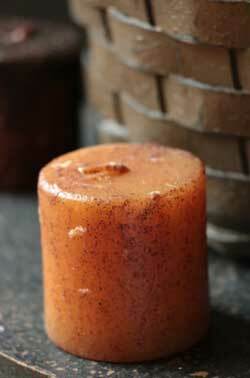 The Primitive Mustard candles are a mottled mustard color rolled in spices. Has a very light cinnamon fragrance. This is for a mini sized pillar candle, measuring approx 2 x 2 inches. Other sizes and shapes also available!